I was worried how last week would go. 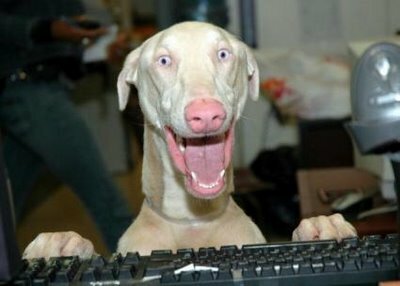 How could I possibly keep up the excited puppy heights of hosting the Geography Awareness Week TeachMeetNZ and being at the inaugural EdChatNZ conference? 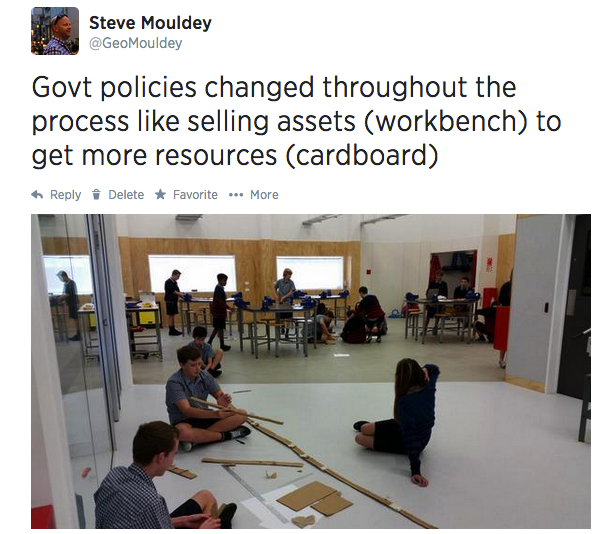 The Monday following EdchatNZ conference saw me spend the day in the Take Action big module I am co-teaching with Bryce and Martin. I spent 2 of our blocks helping Martin in the workshop as students constructed marble runs while their groups were affected by changes in government policies. Students also had similar experiences with Bryce as they played Volleyball with Government policies affecting the rules for each team. The final block focused in on actions we can take as citizens other than voting and brainstorming issues of interest to the students. Yesterday students picked up from this as they focused on issues they wanted to take action on. They explored them in depth so they could first of all justify why it needs to be worked on and then gaining a deeper understanding of the issues. The day finished with students generating questions about their issues to ask the Upper Harbour election candidates in our MP debate next week. Tuesday last week was a Double Design Thinking Day. In our Taheretikitiki community we worked on How Might We help Paraparaumu School recover from their fire. The students worked through a Design Thinking process to generate possible solutions to help the students out. These solutions were then shared with the Principal of the school and this week we are continuing to plan our fundraising day to take place . My Big Project group this term are a landscape design group. We are designing and building a garden for a local resident in our developing community. The designs will also be shared with Hobsonville Land Company and Auckland Council as models for future developments. We had started by looking at gardens we liked but this week was all about gaining empathy for what our partner would like. Wednesday is an admin type day for me this term. Collaborative planning sessions, reflections etc. The highlight of the day was the Auckland Geography Teachers Association committee meeting where we were planning the end of year PD course. 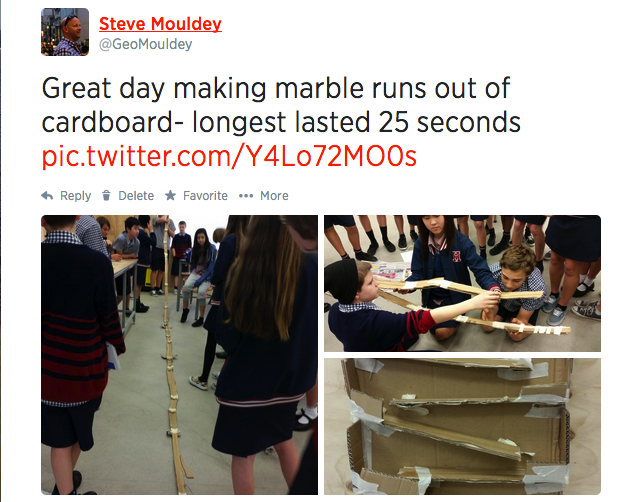 Mary and Jade had also been at EdChatNZ so our end of year course has been highly influenced by this experience. No longer focused on assessment, specific standards etc. the day will instead focus on improving our pedagogical practices – more detail on this soon from the AGTA website. Thursday was spent working on the next iteration of our module structures based on feedback from staff. We also completed the survey for students to evaluate our module structures this week. Now that we are 2 1/2 terms in it is time to do some real critique of our systems and work out how it should be improved from next term and looking towards the multi-level structures required from next year. I am really looking forward to working with an awesome bunch of educators at the end of September as we undertake some moonshot thinking and learn from the Google and NoTosh teams. So, all in all, an awesome week. All of this was awesome from my perspective. But how do I know it worked well for my students? I have evidence of ‘work’ achieved in that time. I have snippets of informal conversations that occurred about how students felt it went and their enjoyment of the lessons. The only module I have reflections from in that time is Apocalypse Now (where students paired up, told each other how they had been going and had to write the narrative for each other). 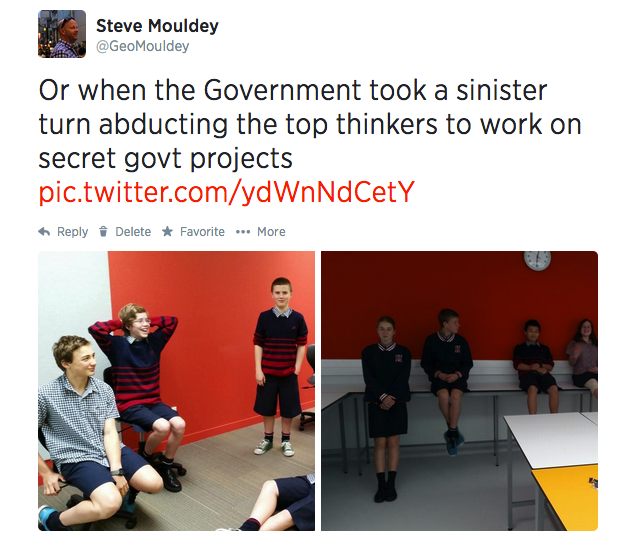 I don’t actually have any specific feedback about how students thought the modules went. Were there opportunities they saw that I missed? Did the activity I thought was awesome actually help them progress in their learning? I’m not sure I can answer that, which is a concern to me. I have a concrete understanding about student progress within my modules due to the conversations with students and the documents they have shared with me. But I have not collected any information that could critique how these modules are going. This is my issue. I want to see a culture of critique develop but have not done anything in over a week to help this happen. Set up a routine for students to give Rose, Bud, Thorn feedback at the end of that module each day. In this way, I can actually see regular feedback from students on how the activities occurred that day. Get my critical friend Maurie to observe more of my lessons to get a more in depth critique of the teaching and learning occurring. Invite questions/challenges/critique from any others who visit or observe my teaching (if you visited Apocalypse Now during the EdChatNZ conference please feel free to send me some comments). In this way I may hopefully gain a better picture of how others view the learning occurring and keep improving my practices. And surely that’s the goal right? That’s what we have the moral imperative to do as teachers. Keep on improving our practice. How do you keep improving? 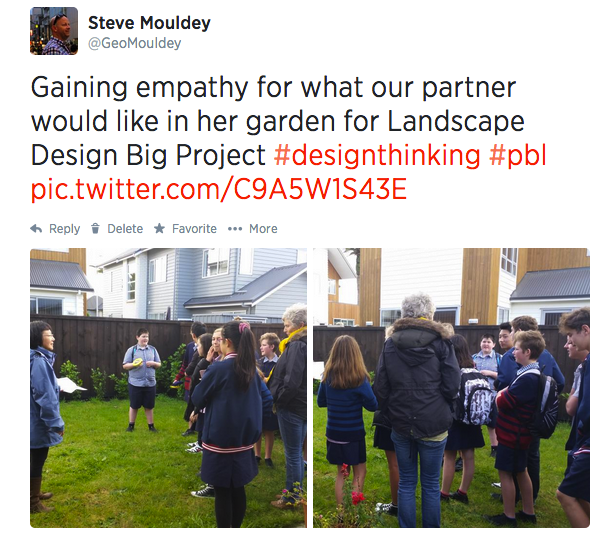 This entry was posted in Uncategorized and tagged citizenship, critical friend, critique, design thinking, Hobsonville Point Secondary School, inquiry, learning, pbl, reflection, student voice by stevemouldey. Bookmark the permalink.